A guide to Amish furniture in Vermont No Amish live in Vermont, but the state has at least one Amish furniture dealer, accessible to residents of Burlington and other cities across the state. Amish furniture is well-known for its high level of craftsmanship and use of quality solid hardwoods such as oak, hickory, cherry, walnut, and maple. Amish wood craftsmen produce home furnishings for the dining room, living room, office, bedroom, children’s room, kitchen, plus outdoor furniture and structures. 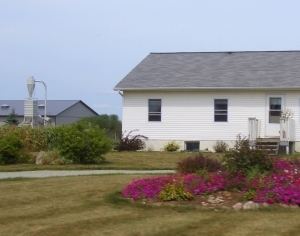 Amish-made indoor and outdoor furniture, along with a wide selection of sheds, gazebos, cabins, barns, horse barns, chicken coops, playground equipment, cupolas, weather vanes, and outdoor furniture such as benches, tables, chairs, Adirondack chairs, gliders, swings, A-frame swings, chaise lounges, balcony and deck chairs, and more. Seeking Amish furniture outside Vermont? Check the Amish Furniture directory for Amish furniture sellers and Amish wood craftsmen in the US and Canada. Note to Vermont residents: Please be sure to check opening hours of any Amish furniture businesses listed in this guide before traveling long distances. While we strive to keep this directory up-to-date, business locations and schedules can change. Not responsible for changes to information. There are no Amish communities in Vermont, with the nearest Amish presence found in New York and Maine. A pair of Amish families made a brief attempt to settle in Vermont in the 1970s, but for the most part the Green Mountain State has attracted few Amish. However with the tendency of Amish to migrate for farming purposes, and with established Amish communities in neighboring states, we may one day see a Vermont Amish community putting down roots in the state. Amish furniture has enjoyed quite a run in recent years. As more attention has focused on Plain People and their lifestyle, interest in their products has correspondingly increased. Outsiders associate Amish with natural methods and old-fashioned ways of doing things. The association has no doubt helped Amish furniture thrive, even if the perception does not always match reality. Contrary to what some might believe, Amish woodworkers, for instance, use modern power tools and techniques. The manner of deriving power differs across Amish society–more conservative Amish rely on a drive shaft and pulley system, while more progressive Amish use hydraulic and pneumatic power. In both cases diesel engines create the energy which is funnelled into each respective system. Generally speaking, one “old-fashioned” aspect of furniture-making which the Amish do adhere to is an attention to detail and quality craftsmanship. As a rule, Amish woodworking shops are small operations. Amish may employ a handful of workers, or recruit family members into a business. Businesses larger than 25 employees are uncommon. In many cases the owners of shops work alongside their employees. Amish furniture comes in a wide variety of styles and designs. Common furniture styles produced by Amish include Mission, Queen Anne, Prairie, Shaker, Arts and Crafts, Craftsman, as well as Urban and Contemporary styles. Most of these furniture pieces Amish would not use in their own homes, but when it comes to business, they are adaptable and able to create products designed to satisfy a diverse market. Amish woodcraft typically is made using solid woods. Hardwoods used include oak, cherry, maple, walnut and hickory. Amish also make softwood furniture from woods such as pine and cedar. Working in tandem with Amish furniture businesses, Amish finishing shops provide the final coat to enhance the attractiveness and durability of a piece. In addition to creating standard furniture lines, Amish wood craftsmen build custom furniture to the specifications of individual clients. Custom Amish furniture work usually requires a substantial wait time, though experiences may vary. Amish also create custom kitchens, with cabinets and kitchen islands crafted to fit the individual homeowner’s needs. Vermont Amish furniture shoppers have a few options. Amish furniture can be found in the Green Mountain State in at least one location (see above). Those wishing to visit an Amish shop in person can find Amish communities throughout New York State as well as in Maine. Want to order from the convenience of home? Try an online retailer like Dutchcrafters which delivers their Amish & Mennonite-built products to Vermont addresses.